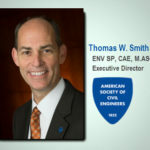 The ASCE Board of Direction has selected Thomas W. Smith III, ENV SP, CAE, M.ASCE, as the next executive director of the American Society of Civil Engineers, effective Jan. 1, 2015. Smith, ASCE’s current deputy executive director and general counsel, will succeed Patrick J. Natale, P.E., F.ASCE, who has served in the position since 2002 and announced his end-of-year retirement last October. With a master’s degree in structural engineering and a B.S. 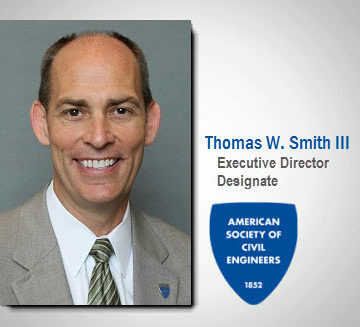 in civil engineering from the University of Virginia, Smith has been a dedicated ASCE member for more than 25 years, and the association’s deputy executive director since 2010 and general counsel since 1997. Smith also holds a law degree, and before joining ASCE practiced law with a focus on land use issues. 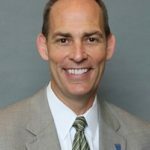 During his tenure at ASCE, Smith has provided leadership, direction and management oversight across a wide spectrum of ASCE’s programs, operations and strategic initiatives, working closely with ASCE geographic and technical organizations and affiliates worldwide. Smith is also a Certified Association Executive (CAE) and an Envision Sustainability Professional (ENV SP), and has been active in his community. 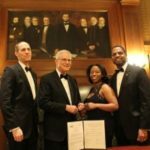 He serves on the Fairfax County Board of Zoning Appeals, and previously chaired bar association committees providing legal services to local homeless shelters as well as coordinating national moot court competitions. Smith has published articles on engineering ethics and legal issues and is a frequent speaker on these subjects. In 2012, he penned the book “Infantry Rifleman, WWII Reflections of Thomas W. Smith,” a tribute to his father. A fond farewell to Pat, I worked with Pat when we both served on the NSPE’s BOD. It was a pleasure to have worked closely with Pat and we wish Pat, a long, well deserved and pleasant retirement. Also welcome to his successor Thomas Smith III, P.E. ENV Sp CAE M.ASCE having served with Pat, as an example and having the depth of knowledge involved with the legal perspective, I am sure that Tom will give the ASCE a real boost. Thanks so much for the work that our professional managers and “governance people” put into our professional and specialty engineering organizations. CONGRATULATIONS to you, Tom…such a well-deserved honor! It has been a pleasure to get to know and work with you in the past and I hope to continue for many years into the future! Such a bright, promising future for ASCE! Tom, I’m so very pleased with your selection. It’s been a pleasure to work with you in the past and am looking forward to working with you in the future. Thanks for so many kind words. Your support means a lot to me as I take on this new responsibility. I look forward to meeting or reconnecting with many of you in Panama or at other upcoming ASCE events. Well deserved. This is a bright time for ASCE to have your talents move to the lead role at ASCE. And what wonderful continuity to build on Pat’s strong leadership. Congratulations! Tom! We are waiting here at Kolkata, India to welcome our Executive Director Designate. Pat opened up the avenues and we are confident that you shall make those wider and smoother for our ASCE in the years to come. Hi Tom, Congratulations on your appointment as the ASCE Executive Director. ASCE will benefit tremendously from your experience as Executive Director with long background of ASCE as Legal Counsel and as well your great in-depth knowledge of the Society, her vision, mission and goals especially in the areas of Globalization, Sustainability and issues of present and future concerns of International Membership. A well-deserved promotion and look forward to seeing you soon in Mumbai, my home-town. An equally capable Executive Director replaced a very able and accomplished predecessor. Congratulation Tom!!! Congratulations to a fellow UVA Alumni. I know that ASCE will be in good hands and I look forward to following your tenure as Executive Director. An excellent choice; your selection assures a very bright future for ASCE–congratulations, Tom! Congratulations! Great selection! Look forward to helping you in any possible way. When are we Going to raise the bar with our ASCE web presence and why am I sending this request to my president over linkedin. Inquiring minds would love to know and so will our current and next generation of bright engineers. Engineers of today & future will need to understand usability and integrative engineering and ASCE need’s to walk the walk and talk the talk . Thanks for the well wishes. Stay tuned for some big changes to the website later this fall. Congratulations Tom on your selection as the next ASCE Executive Director. I know you will continue to do a fine job for ASCE members and staff. Congratulations to Tom, a well deserved recognition of the value he has brought to ASCE in the past. All the Best to Pat. Congratulations, Tom! I can’t believe we’ll have a lawyer at the helm, but we know you’re a CE at the core and we couldn’t have chosen a more deserving leader. Looking forward to seeing you soon in Texas! 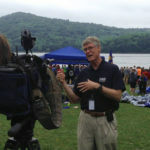 Fred P. Wagner Jr., Jr.
Congratulations on your selection. I know that ASCE will be in good hands. Look forward to seeing you sometime in this new position.